Recently at a local art competition there was a huge exhibit with facts and figures showing the evils of factory farms, and how meat-eaters use up so much more of our earth’s fuels and resources than non-meat-eaters. What got me going was that there was nothing there about sustainable farming methods as an alternative, only gads of information about how ethical vegetarians are. (Thankfully Kent was around the corner because I almost started a scene…he hates scenes.) Just then the artist's friend happened to be there and overheard me saying out loud, “But this is just wrong!” He said, “What's wrong? I know the artist, I can pass it along.” I told him that I wished he had used this opportunity to raise awareness on the better option of sustainable farms and animals raised ethically, how it CAN be done well. He said, “Yeah, I think he knows that…” He walked away and I wanted to scream, “Then why didn't he show that, too? !” Imagine how many people could've been impacted then! “When visiting your exhibit recently, I was disturbed by parts of what I saw and thought I would try to explain. While I agree with some of what you shared, and I also detest factory farms, (terrible for the environment, for the animals, and for those who eat that meat), I do wish, however, that you would have shown another side to the story besides vegetarianism. 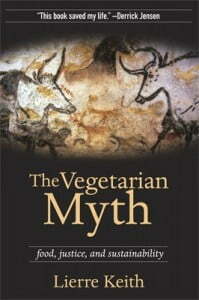 I'm wondering if you've heard about this book – here is an interesting review on “The Vegetarian Myth“. Also, here's an article on the China Study: Flaws in the Vegan Bible. I don't pretend to be an expert on this issue by any means, so I thought I'd direct you to a few more interesting links (below) that you may be willing to look over. Readers, I'd love to hear your thoughts on this issue! And by the way, if you're cutting back on meat for budget reasons, which we do here sometimes, too, just be sure you still get plenty of pastured dairy products and good homemade bone broth. Often in the cultures Weston Price studied, they could only afford meat once a week, but they ate soups with bone broth and vegetables to fill in. Here's my list of healthy meatless meals. Are we meat eaters or vegetarians? Very familiar with it and the author. Mark Hyman MD was one of our supporters when I was involved in my (now defunct) business. Long story! He’s a functional medicine doc and although he advocates a plant-based diet, he is not a vegan/vegetarian nor does he bash meat. In fact he endorsed bone broth and all sorts of good stuff. You can PM me if you like. I have the book. The truly aggravating part is that CAFO’s are only the last part of a meat animal’s life span. I live in one of those areas that works just fine for raising beef cattle, but the land isn’t terribly suitable for crop farming–the Missouri Ozarks. Missouri is usually either the 2nd or 3rd biggest cattle producing state in the country (the other 2 of the top 3 are TX and FL), and most of those cattle spend their time prior to going to the feedlot on small farms, in pastures, eating grass. Land is very cheap here, and many country folks have some acreage & will raise enough cow for their own use, maybe some to share with family or neighbors, and maybe some to sell, whether to the feedlot or to private citizens. Mostly, they’re not full-time farmers, although there are plenty of those, too. It’s not hard to find someone to buy a quarter of a beef from, and, if you arrange for your beef early enough in the season (or from the right farmer), to arrange for it to be antibiotic-free. The climate here is fairly mild, but the land is too rugged & the soil too thin and rocky for crop farming, unless you have river bottom land. It’s fine to grow grass for cows, though. I think a diet works best if you eat for your metabolic type and not for any other reason. I wanted to be a raw food vegan because of the gobs of information about how healthy it is. There is also gobs of information about why it isn’t. I developed hypothyroid and with it a long list of symptoms. I already had MS and it was difficult to attribute symptoms to one or the other. I finally had a hair mineral analysis. It showed that I needed protein and fats. The MS diet that I hear about regularly suggests low fat. Raw foodists eat lots of nuts and seeds and I thought I could get enough fat from those. They don’t contain an amino acid that makes them complete proteins. Long story longer, I became my own test case and Weston A. Price trumps T. Colin Campbell when it comes to a diet for me. In your experiences you might have a different outcome. There has never been one perfect diet for all people, as was observed by WAP. We do best eating an ancestral diet. My ancesters ate meat. When it comes to the environment I don’t support the factory farms but I believe Global Warming is planetary recycling and the part about it being man-made is political. I have major issues with pollution and freak foods (GMOs, chemical creations, cloned animals) but it’s here and we need to find ways to deal with it and/or change it. Writing to the artist is an attempt to raise awareness. Thank you! Thank you so much for sharing your thoughts! I’m sorry that I came off as putting others down, I never want to do that here. I do realize that vegetarians are healthier than vegans because you drink milk, eat eggs, etc., but when I said that I think vegetarianism isn’t great because OFTEN they rely a lot on processed soy for a protein source, I was going by what I witnessed with a friend of mine. She used to be vegetarian, but I always said she was the healthiest vegetarian I knew. She and her kids ate plenty of animal products (milk, cheese, eggs, butter), but still, she admitted that she had to depend on some processed soy or other boxed protein products (made from fungi or something?) to get the protein in. I think it would be difficult to do so without adding some of that stuff in, but feel free to correct me on that. Hi Kelly, Thanks for taking the time to reply~I really appreciate it! I also wanted to add that I think that I DO get enough protein in my diet. (And my cousin and her family are vegans, have been for years and are super healthy!) I myself, find that not eating meat actually finds me eating more vegetables than I ever have. Also, not making the mistake of eating anything processed, including soy. For instance, I make homemade hummus and the chickpeas are great protein. I make my own soy milk, add any flavor and sweeten it with Stevia or agave syrup. It looks like more and more people are going back to scratch! I grew up on “meat, potatoes, vegetables” for almost EVERY dinner. So, I find that more variety really is the “spice” of life! Your comments have given a good “balance” to this post, thank you! She and her kids ate plenty of animal products (milk, cheese, eggs, butter), but still, she admitted that she had to depend on some processed soy or other boxed protein products (made from fungi or something?) to get the protein in. I think it would be difficult to do so without adding some of that stuff in, but feel free to correct me on that. Our protein comes from beans, nuts, sunflower seeds, eggs, dairy (especially yogurt), sorghum syrup, nutritional yeast flakes, and occasional soy. We also eat fish, usually Alaskan salmon, once or twice a month, and I take fish oil capsules daily to prevent migraines (which are a problem for me) and colon cancer (family history). A few times a year when I’ve been sick or something and feel run-down, one portion of turkey will give me a boost. So we are not strict vegetarians, but we do just fine eating no meat (even fish) for weeks or months at a stretch. Like Charlene, we eat a lot more vegetables–both quantity and variety–than we did when we were filling up on meat every day. I learned to cook in the conventional way, using supermarket meat in every meal, so I am making a fair comparison when I say that our current way of eating is easier. We eat things that don’t go bad so quickly and don’t require such careful cleanup as meat. Canned beans and dry lentils are extremely convenient. (Other dry beans take so long to cook that they’re difficult for people who work outside the home, as we do.) Many of our proteins are easy to add to whatever we’re cooking. People who say, “But what do you eat instead of meat?” often are thinking that protein has to come from the main dish. But the times I’ve tracked my diet, I’ve seen that I’m getting enough protein and about half of it is coming from ingredients I add to food or use as condiments or eat as side dishes (like rice). Some of these are substitutions, like sorghum syrup which we often use in place of things that are sweet but have no nutrients–it’s easy to “sneak in” nutrients when they come in sweet and gooey form! About use of meat: The matter could be framed as yet another question of resource utilization & respect. Fact o’the matter as I understand it, is that (unlike some Paleolithic Eden) we consume meat as well as we do everything, to satiation, with no sense of how the animal is apportioned among the tribe. We live on such a large scale, the cycle of things is obscured. So, zooming out for the view, we see that much careful use was made of organ meat, muscle meat was often thrown to the dogs. In Nino Chochise’s autobiography, the old “shaman” (Dee-O-Det) regularly consumed “shaman soup” for which the recipes requires that the entire animal be thrown into the pot. His longevity & vitality were extraordinary. Boiling marrow-rich shank bones, or any bones, down into a gelatinous broth, is an incredible tonic for a great deal that we’ve forgotten. I do know it’s a fast cure for esophogeal problems, often common in the elderly. We’re so focused on the food (or is it entertainment?) that we’ve forgotten the primal materia medica, and the large role that a variety of animal & insect parts play in traditional herbalism. So which is the more pressing ethical issue? Eating animals? Or treating all resources with respect, since all are part of The Living Whole? Hope you don’t mind my leaving yet another comment after hitting the length limit on that last one! I wanted to say: Just yesterday I read a blogpost by a vegan environmentalist about how she’d finally found a great coffee shop that “even has vegan cream cheese!” but was disappointed that they use paper java jackets on their glass cups. I wondered if she’d ever thought about the resources used to convert soybeans into fake cream cheese and how that compares to the resources used to make a paper java jacket! Fake foods are really not the answer to anything. One more thing about CAFOs vs. cornfields that I meant to say above: If there were no more CAFOs, Amy’s problems would be significantly diminished by the drop in demand for cheap corn and soy. Perhaps after many years of hard work, Iowa could be restored to health and become a land of diverse, sustainable farms that grow both plants and animals. I traveled all the way across Iowa for the first time last spring, and I was appalled; rather than the wholesome breadbasket I expected, it’s a wasteland, a forced-labor camp for corn! I can’t understand how people get into vegan diets to prevent the deaths of animals without ever thinking about the horrors inflicted on plants. Amy, I am praying for you and your family and neighbors and the bees. Late comment here – Anyone who eats only plants, thinking this is more humane to the animal wrold, hasn’t noticed how many animals have to be destroyed to protect the plants. A small garden (or large field) with vegetables fror human consumption in it has to be protected from birds, deer, rabbits and many other creatures. On a small scale, farmers use electric fences and traps. On a large scale you can be sure there is shooting and poisoning. Feedlots are much less humane than a kindly raised animal slaughtered by somone who respects it. And to quote Temple Grandin, “Nature is cruel. We can do better.” Animals in nature often die horrifying, agonizing deaths. They are sometimes eaten before they are dead. IMO, the failure of the meat decliners to acknowledge the inherent violence of the natural world enables them to feel superior to those of us who eat meat. I prefer not to make it a moral decision but a health decision. I have never found valid research that indicates there is any advantage to not eating meat. Betsy, I partly agree with you. The idea of abstaining from meat because “it’s killing” has always confused me because plants are alive, too, and in fact many vegetables are sliced, cooked, and eaten alive!! And killing bugs that try to eat your garden is indeed violence, and if rabbits deserve full rights then we shouldn’t fence off part of a meadow for gardening. I also reject the argument that caring for animals in order to harvest their products while they’re alive (milk, eggs, wool, etc.) is inherently cruel. It’s the WAY these things are sometimes done that’s bad–like cramming hens into tiny cages and cutting off their beaks so they can’t hurt each other. I get the most healthful/humane stuff that’s feasible for my budget. After making milk myself, I feel more strongly that humane dairy farming is just fine: If I could have gotten a job just hanging out all day in between hooking up to the breast pump, with room and board included, hey, that sounds like a great gig! My reasons for reducing meat are predominantly environmental and have nothing to do with thinking “cruelty” to animals is worse than to plants. As for the health issues, I don’t know what you would consider “valid” research. I am a research professional in another field (social science) so I read research findings very critically, thinking about the study design and statistical evidence, and I think it’s becoming very clear that meat of the typical American type is unhealthy; Center for Science in the Public Interest is one of the most reliable resources I’ve found. There is far less research on the more sustainably raised meat because there are so few people eating exclusively that kind. For me personally, a low-meat diet has been really easy to accept, and I’m healthier than I was when I ate meat almost every day. I suspect that not all people are the same and the optimum diet is different for different people. Maybe some people really do need to eat meat. But I find that most of the people who question my diet and are sure they could never tolerate it themselves, have never tried! I think it’s a great letter and thanks for writing it. When I see that type of information now I grimace, because I remember being on that side and I also remember how staunchly sure the veggies are that they are right. It’s almost similar to extreme religious folks. Way to go, Kelly! I share your frustration at the half of the picture presented by vegetarian critics of factory farming. Thanks for speaking up to present the other half and for the articles you gathered; I will look them all up and read them. I have been gathering similar resources to combat the half-truths of vegetarianism. Yup, I’m another reformed vegetarian! I was a raw food vegan for 5 years. I was eating that way for health, not for moral reasons. I learned that I got healthier for awhile, probably due to the fact that I wasn’t eating processed Frankenfoods, but I started having serious deficiencies. I began the Weston Price paradigm recently and I have seen steady improvement. I live in ranch country and I buy pastured beef and free-range eggs from local sources. I have yet to find a local source for raw dairy. There was a CAFO near me that has recently closed. Most of the ranchers give their cows antibiotics. I was fortunate to find one who doesn’t medicate or feed is animals corn or some of that other stuff in cattle feed. I just watched Food.Inc. and it amazes me what people eat and the affects that factory farms are having on our country. There is so much mis-information about healthy food. I have not bought food at a grocery store for a long time, thank goodness! ‘Becca, I live out here in middle of GMO soybean and corn country. I do have have to walk more then a couple hundred feet in any direction to be in a field. I also live in the middle CAFO country. I would not eat the meat of one of these animals. We raise all of our own. Thank the good Lord! My point is, You are wrong and so all all vegetarians if they think soy or corn is less harmful. With the increase use of hybrid-GMO’s, they get quanity but not quality. The soybeans plants are infested with aphids and the corn plants have molds. This means that the plants are very sick. They are not getting good nutrition from the poorly maintained soil. Aerial spraying has increased 417% in the last ten years because the chemical companies use their products as a band-aid. THe aphids have become resistant to the pesticides. They used this summer two or more pesticides to douse the soybeans to try to slow the aphids. The corn is being sprayed with a pyraclostrobin fungicide that is acutely (deadly) toxic to all aquatic organisms, ducks, quail, and bees. Iowa (where I am at) loses 64% of their bees every year not from CAFO’s. Our creek is dead of all life not because of CAFO’s. My family has been sickened each summer but it is not CAFO’s. We live in a cancer cluster but it is not because of CAFO’s. It all goes back to the chemicals sprayed on the corn, soybeans, pastures, and hay fields. If you want to know more, you can check out my blog. Start with 9/11/09 entry. I would live rather live next door to a CAFO then the fields that I live by now. I do have to say one thing about my neighbors. They are good people. They just are not educated. The chemical companies, grocery stores, meat packing plants, Farm Bureau etc. keep a pretty good grip on the information that is fed to this part of the country. You’ve got a good point! For me and a lot of other people who are vegetarian (or mostly so) for environmental and health reasons, the real key is that it’s EASIER to reduce factory-farmed food by cutting out meat than by finding alternative meat. If you cook most of your food from scratch at home, if you live in a rural area and know farmers, then natural meat is more feasible than if half your meals are restaurant and convenience foods. That said, I’ve found that some vegetarians are very resistant to thinking about whether their soy, corn, fruit, etc., were factory-farmed and doused with pesticides. It’s probably true that these foods are not AS harmful to health and the environment as CAFO meat, but they definitely ARE part of the problem rather than a good solution! I’ve been careful about soy (minimizing our use of fake meats; buying only non-GMO) and favoring organic produce for a long time, but it was only 6 months ago that I realized that Honey Bunches of Oats cereal–my 4-year-old’s favorite food, which he’d eat twice a day if we’d let him–is full of commodity corn laden with atrazine, like I’d just been reading about in The Omnivore’s Dilemma! HBOs immediately went from a pantry staple to a “sometimes food” that we buy only when they’re on super discount at Costco. I was impressed that my son’s reaction to this news was to launch experiments to season his organic oatmeal “so it tastes just like HBOs”–he’s satisfied now, probably eating a lot less sugar, and definitely saving some money. The rain forests are not cut down just to graze meat, but to grow GMO corn. There are places that simple will not sustain grain and vegetable growth but will sustain (and do a very good job of it as well) of being grazing land for cows. I’m reading a book now on farmers and the environment and one article talks about the farmer turning an area into a mini wetlands that the cattle grazed on and some birds nested in. I think Gene Logsdon talks about this problem as well. Great job. I probably would have gotten fighting mad, and gone home and stewed about it for a couple of days, composed several angry emails in my head and gradually let something else take the forefront in my life. And, the end I wouldn’t have done anything except let it negatively affect my blood pressure for a while. I have learned so much since reading the real food blogs for the last 8 months or so … not the least of which is I am not helpless in my frustration over certain things. An interesting thing for me to note is I have never even considered vegetarianism but I didn’t know squat about any of my food sources. Totally uninformed. I thought I was doing a good job since we were shopping a lot of organic stuff and grinding our own wheat but it wasn’t until getting a copy of NT and then looking for more info on the web did I begin to understand anything about “CAFO” and “pastured” and all those other new-to-me terms. Amazing how ignorant I was on my SAD diet. Thank goodness for you, Kelly, and others who are so passionate about getting the truth out. Wow, Kelly, what an inspiration! It’s so good to hear from people who take a stand instead of taking the backseat. Bravo! I am proud of you, Kelly! If we all could speak up (at least once in awhile) we really could make a difference! You up your fortitude! This sort of thing drives me nuts as well! What I have noticed is that people who promote vegetarianism/veganism as some sort of moral virtue typically have no knowledge of farming or soil. Vegetables are annuals, and strip the ground of essential nutrients. Pasture vegetation, especially the clovers, enhance the soil and provide a blanket of protection for the top soil, which is good therapy for any piece of ground that is depleted. 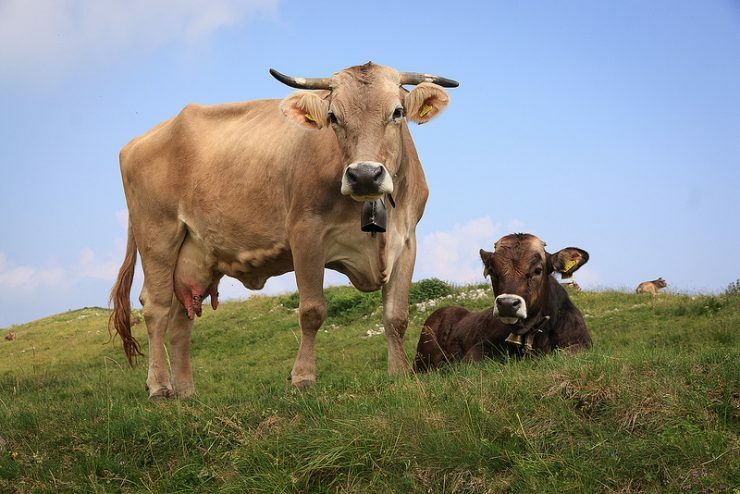 When animals graze pastured ground, they are in a symbiotic relationship that results in better soil. If annual vegetables are not rotated with pasture, and the ground kept in pasture MOST of the time, the result is destruction of the soil and a need for trucking fertilizers, usually synthetic at that, onto the farm. It is too bad more folks do not study the nature of farming and soil health when thinking about this issue. Well, there are two sides of the story (and the truth is in the middle). You are only stating a part of it. The soil that grows the vegetables, have to have fertilizers and nutrients put back. Pasture is fantastic, as long as it isn’t covered by a factory farm! Research what happens to that land. For example, there are no laws that stop them from having OPEN plots of animal waste. The methane coming from these farms pollute the air to such a degree, that the poor small farmers (that have not been bought out) get sick from breathing the AIR. Not counting the waterways that can not be fished anymore. I are not talking about animals in nature, I am talking about GREED and MONEY. Because of the fast pace in these factory farms, the animals are sometimes slaughtered alive. There is no need for needless suffering. Also, the antibiotics and hormones put into this meat BECAUSE it is so unsanitary and they want to make the animals GROW ASAP. YOU then eat this meat with all this garbage in it. Antibiotics (in the U.S.) are given to livestock MORE than people. So, now, you have to worry about the Super Bugs (swine flu, avian flu, flesh eating diseases, etc.) that will, and some have, resistant to antibiotics! Imagine, not being able to fight a disease! So, this is my long way of saying; IF you eat meat~KNOW WHERE IT IS COMING FROM. Make sure it is 100% organic, including your vegetables! Good luck hearing back from him…I’ve found from experience- and I’m not trying to offend anyone-that most vegetarians have an almost cult-like passion to their lifestyle. I was a vegetarian for fifteen years (vegan for two) and I can tell you that it was only when I started to see the ugliness in my fanaticism, and in the friends that shared my beliefs, that I started to question my choices. Vegetarians are fully aware of the alternative to factory farming but they don’t care because it isn’t really about factory farming. They don’t want any alternatives but vegetarianism. A healthy, happy cow raised on pasture but slaughtered isn’t a better option (in their opinion) than a cow tortured in a cage and fed soy. It is still putting the needs of humans above the life of an animal. I bought into the whole ideology for years and even (almost) convinced myself it was more Christ-like to be vegetarian. Thank goodness I’m free of that dogma today…and healthier too! Kudos for trying to educate someone who was spreading a self-righteous and rigid theology. That’s what is, really. Vegetarianism can easily become an idol. Your letter was fair, honest and polite while also unapologetically truthful. Actually, I think vegetarians may be the ones promoting ruin for the earth. It is because we have so much cheap grain, soy, etc. available that the human population has grown so large. If we as a species had continued to rely on animal products as our primary sources of calories and nutrients, we would never have increased our population to such an unsustainable level that we came to rely on factory farming to feed people. You absolutely did the right thing! I am so SICK of people being misinformed on this topic. In fact, I just read an article on the Huffington Post yesterday by Natalie Portman about how she became vegan for these very reasons. Ugh! So frustrating. Thanks for your efforts to educate. We can all do something about this. Kelly, I was just thinking about you yesterday and wondering how this effort was coming along. I’m glad you were able to get a thoughtful and well-supported contact into this artist. These points you make are so important because so many people truly believe all meat is unhealthy to consume and it’s so critical that we educate and make aware what’s really going on. Thanks for this post, I didn’t have time to read through all the great comments because we’re in the middle of our school day, but I’m going to come back later and thoroughly re-read the whole thing. Also, many thanks for including my article about PETA in your list of resources, as I think it’s something that a lot of people who support efforts like PETA simply don’t think about – at all. They are so used to purchasing and eating vegan products, they don’t stop and ponder, where exactly does this “food” come from that I’m eating – and what is its real impact on our health and the earth? I would have caused a scene. If you don’t, who will? This is important enought to cause a scene. Most people don’t even know that there are better options for farming. They’ve never heard about sustainable farming. I cause scenes about food all the time. I try to be nice and informative though. I blame greed. I mention how big business has ruined our health. Most don’t like greedy big businesses so I think often times my message gets heard and accepted. Thank you for speaking up!! So many wouldn’t have said a word, or questioned. Just walk by taking it for face value. As an art major I can say the artist certainly got what he wanted; disscusion, thought provoking-ness (if that is a word), and reaction. Terry, I can appreciate that and it makes a lot of sense, but in this case, is the artistic expression really worth the misinformation that it promotes? Kelly, as someone who greatly values the importance of pasture raised meat and sustainable farming, thank you for taking the time to write a letter to the artist. This artist was very successful with his /her exhibition. Let me explain. A successful artist will invoke a response from his /her audience. This is what this artist did. I’m sure the artist was well aware of sustainable farming but chose not to show it for very specific reasons. As an artist who has exhibited very controversial issues, I purposefully do not show all sides. Only the side I want to specifically portray. Sometimes it’s about specifics and not the totality of the issue at hand. I’m glad you did this. The more time and energy we spend on reminding people that there ARE other options for meat and that cutting it out is not an automatic “fix” is time well spent. If anything, I’d also direct people to Nina Planck’s book and the chapter about how animals can benefit a vegetable garden/farm. Kelly I think that you handled this situation beautifully. I have met and talked to several vegetarians who made that choice because they did not want to throw their economic support behind factory farms. Truly, I can’t argue with that. But sometimes people just plain are not aware that such a thing as responsible husbandry exists. It is such a great satisfaction for me to be able to talk to people like this, and explain that there ARE stewards of the land who strive to raise food as healthfully and as humanely as possible, from the soil up. However, there are many people ( like your artist, I’ll wager) for whom it is all or nothing. They’ve just made the decision that eating meat in and of itself is the problem. Further, they aren’t particularly interested in hearing any real solutions to the problems of land erosion, inhumanely treated animals and unsafe food practices. I have to say, your intelligent and deliberate response to the artist is really a great example. I’m afraid that in your shoes, I would have just been provoked to anger. Thanks Kelly. I always learn about something I’ve not heard before…checked out the video clip on the book The Vegetarian Myth. The author comes from being a vegan and simply knows the “routine arguments” for it: I hope to read it soon. I’m glad you wrote the artist a letter. Whether it works or not, at least when the time comes [and it will] when he starts questioning his health choices for whatever malady occures, he will have *heard* something that will send him on an objective search and hopefully he’ll land on westonprice.org and kellythekitchenkop.com!!! Low fat dogma is everywhere even Whole Foods w/ McDougall ‘s cookbook on the shelf. [The CEO of WF just spoke at a week-end for McD]. Sigh. I was disheartened to see that the other day. But, if I can shift, anyone can. Keep writing, Kelly, you have a way with persuasion in the best sense.